"Obedience above all else pleases God the most." I asked the Lord for a word for the year 2011. He gave me the word OBEDIENCE. I was afraid it would be self control...and it was obedience! I got out our very old Scrabble Game and spelled the word to put over my sink in the kitchen. Because I was working on my health/weight I thought it meant...stick to your eating plan. Nope. For me it meant God wanted me to have obedience in all things. As I would read in the Word to tame my tongue..he wanted me to obey. If God whispered to me to submit...I was to obey. Pray more...obey. Spend less money...obey. The list goes on and on. OBEDIENCE is a big word. For each of us it can mean something different. 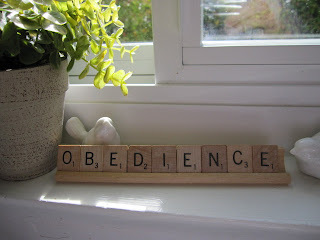 The obedience that God requires of me may be different for you. Some things are black and white for any follower of Jesus Christ. There are no gray areas for those things He commands us to do from His Word. Some things are black and white and others are the whispers of God that we know are meant just for us. I want to hear and obey the whispers as well as the commandments. I have been reading through the Old Testament and one thing I have seen over and over is how God's people continued to be disobedient. All they ever had to do was obey and love Him. I find myself continually saying, "Why didn't they just get it?" Then I remember how many times in a day I don't obey even in the smallest of things. God's mercy and grace are bigger than any of my disobedience's. Thank you, Jesus. "To obey is better than sacrifice." I have asked myself and God, why every time I sat down to write on my blog the words wouldn't come. I seemed empty of anything to say or share with my readers. Great things were happening in my life...but, there were no words. Today I realized I have been on a "Journey of Change." I found myself stepping out into areas that were totally out of my comfort zone. God stretched me in some areas, giving me the gentle nudges I needed..at times I felt like they were more like a shove off a cliff...but all in all...He stretched me and I didn't break! The one change I made this year was my commitment to get healthy. It seemed like a full time job planning my meals around healthy recipes rather than my old stand by comfort foods. I had grown accustomed to making comfort foods ...I thought it would make me feel better. It was a bad habit I had let myself nurture living with chronic illnesses. A friend introduced me to Daily Plate.com. it's an online calorie tracker through Livestrong. As long as I faithfully tracked my calories, I'd lose weight. I hadn't factored in getting older and I thought I could lose it like I did when I was younger. Not so! I lost weight very slowly...very slowly...I had to fight discouragement along the way. My husband joined me on this leg of the journey and we tracked our calories together. We'd shop for fresh fruits and vegetables and we walked this road together. My friend who introduced me to Daily Plate also shared the most wonderful book with me. Made To Crave, Satisfying Your Deepest Desire With God, Not Food, by Lysa Terkeurst. This book may not be for everyone but it was for me. I'll share more on that book in another post. This friend also made a scripture/quotes booklet from the book to go to in times of temptation...I love it! I didn't exercise at first. I actually lost most of my weight without it. But when I started walking the track I loved it. As I walked to Chris Tomlin's worship and praise songs I could see the entire San Bernardino Mountian range as I soaked in God's Majesty all around me. I was really feeling victorious! Then... I tweaked my knee on Christmas Eve..I just moved wrong. My exercise has come to halt. This week I am going to start on an exercise video of chair exercise. DONCHAKNOW that makes me feel really old?? With my DVD and weights that will be my new journey until this knee heals, surgery or God's amazing touch. This is where I have been on part of my journey of change. As of today, I am not going to say.."I wish I could have lost more in this year's journey." Instead I am saying...I lost 53 pounds this year and I give God all the glory! My husband lost 40. He's at his goal..I am not..so the journey continues. To those of you have encouraged me to come back and write again..thank you. To those of you who have left comments and I did not reply...I am so sorry, but thank you! To my friend who encourages me in this journey and to my husband..I couldn't of done this without you both....This was just one part of my "Journey of Change." I'll share more in my next post. I am a Wife, Mom, Gramma, Sister, Friend and my Heavenly Father's Daughter. I love being a stay at home wife and taking care of the needs of my family and home. I have been married 47 years to the love of my life. All content, devotionals and pictures, are ©2008-2016 by Patty at Beside Still Waters. No part of this blog may be reprinted, or retransmitted, in whole or in part without permission. Live your life in such a way that when your feet hit the floor in the morning, Satan shudders and says, "Oh no, she's awake." The enemy tries everyday to get you to quit, then he calls you a quitter. He pays attention to the very big things and to the small ones. "Father, if you do not speak to my heart, then there will be no words that flow from my pen; however, if you choose, with one breath of heaven I can be a conduit of compassion and life."